In this age of Internet and social media, it’s easy to feel like there are few discoveries left when it comes to great travel destinations. 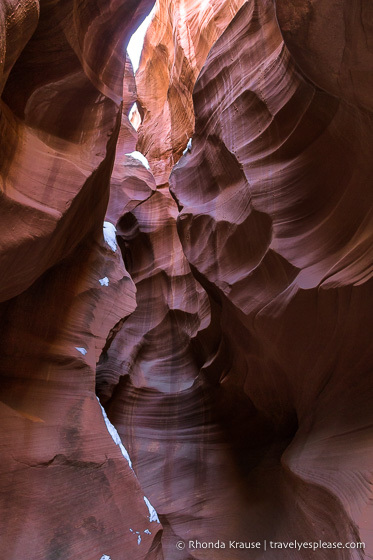 Yet, there’s a slot canyon near Page, Arizona that hasn’t made it onto the radar of most tourists who are following the masses to the famous Antelope Canyon. 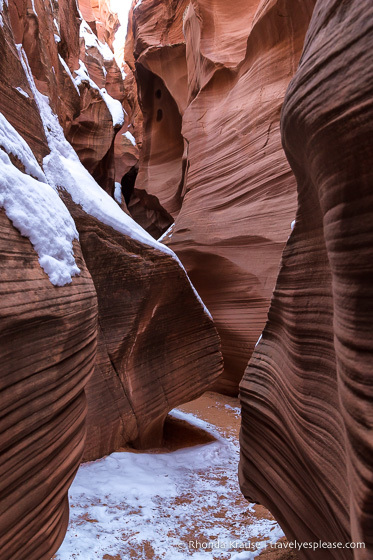 But I’ll let you in on a secret… there’s another slot canyon near Page that is very similar to Antelope Canyon, with its rich colours and swirling formations, but is far more pleasant to visit. It’s called Secret Canyon, or Horseshoe Bend Slot Canyon due its proximity to the Horseshoe Bend Overlook, and while it may rival Antelope Canyon’s beauty, it comes out on top in terms of overall visitor experience. Before I share with you our experience visiting Secret Canyon, here’s a brief background about this special location. Secret Canyon is a branch of the larger Water Holes Canyon that cuts through the Navajo sandstone near Lake Powell. Water Holes Canyon runs east to west, passing under Highway 89 before meeting the Colorado River. The canyon splits into several tributaries, some which have deep narrow sections known as slot canyons. Secret Canyon is a short slot in the middle fork of upper Water Holes Canyon. 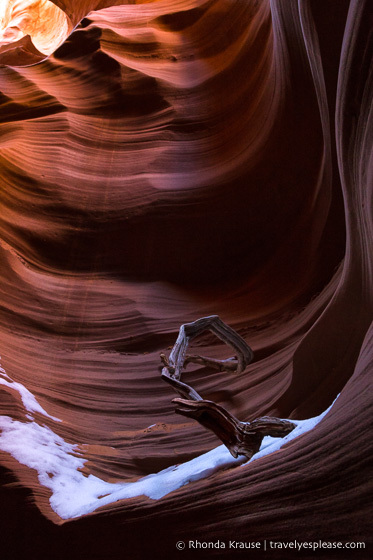 It features the smooth curves, slim passageways, and orange hues that are characteristic of slot canyons near Page. Ever since I first saw photos of the sandstone slot canyons in Arizona, specifically Antelope Canyon, I wanted to visit. However, once I started reading reviews of the Antelope Canyon tours, I was quickly turned off by complaints of them being rushed and crowded, and became concerned about the effects of over tourism. For those reasons, I started to look for an alternative to Antelope Canyon, one where I could enjoy similar scenery, but have plenty of time for capturing photos and absorbing the atmosphere. So I asked around, did some research and discovered Horseshoe Bend Tours, a company that has exclusive access to Secret Canyon and a private Navajo viewpoint of Horseshoe Bend. Since Secret Canyon can only be visited on a guided tour, I was glad that the sole option available to us was a good one- small groups of 15 max, an hour to spend in the canyon, and no other tour groups coming through at the same time. Jackpot! Because I also wanted to see Horseshoe Bend, we signed up for the Slot Canyon and Overlook Combo tour, as it was a hassle free way to see two of Page’s top attractions. Here’s a look at our experience on the Horseshoe Bend Slot Canyon tour! Our tour of Horseshoe Bend Slot Canyon started at 9:00 a.m. at the tour office in Page. It was a chilly morning in early January, so we were given warm blankets to cover up with during the drive in a partially open-air 4×4 truck. After a short trip on Highway 89, we went on a 9.5 km off-road ride towards the canyon. It was a little bumpy in places, but our driver was cautious and took his time so we didn’t bounce around too much. For some reason, I always enjoy riding around in the back of a truck- it makes the trip feel more adventurous! After passing by sandy washes and rocky hills, we arrived a short walk away from the entrance to Secret Canyon. Our guide gave us an introduction to the area and told us we could go ahead at our own pace, as he was going to accompany the elderly members of our group and meet us at the other end of the canyon. As independent travellers, we appreciated the laid back nature of the tour- not being held back and made to stay with the group, yet having a guide available to answer questions as they came up. So, we hurried to the canyon and excitedly began exploring this curvaceous natural wonder! The entrance to Secret Canyon was a little snowy, as it’s more open than other parts of the slot, but I loved the contrast of the white snow with the orange rock (something I wasn’t expecting to see in a desert). The further we walked, the narrower the slot became, and soon the scenery was just like I’d seen in those slot canyon pictures that inspired me to visit Page. The curves and lines in the rock were pronounced, shaped from years of bending to the will of rushing waters carrying boulders, sand, and other debris. The meandering formations of the canyon looked so elegant, sometimes partially hidden by shadows, other times highlighted by the light seeping in from above. I loved photographing the waves and patterns of the rock but my camera was struggling in the canyon’s dark sections. Mike was getting great results with his iPhone, so I let him take over photographer duty in places while I simply enjoyed the surroundings. More photos of Secret Canyon taken by Mike on his iPhone. When we came out at the end of the slot, we waited until the rest of our group and guide arrived. We stood around asking questions about the canyon and Navajo land it sits on before heading back the way we came. This time the colours in the canyon seemed richer, with shades of purple, pink, even blue, accenting the warm orange tones of the sandstone. As much as the dim light made it hard for me to take photographs, I appreciated the moody atmosphere it created. Had we done our tour closer to mid-day, I bet the canyon would’ve had a whole different look and feel. Had to get a falling sand picture! Just as we were exiting the canyon, the next tour group was beginning their exploration. We noticed that this group was sticking together while the guide explained things as they went. I guess you never know what style of guide you’ll get, but the one we had was a good fit for our personalities. Back at the truck, our guide passed out some snacks and water before driving us to their private overlook of Horseshoe Bend for the second half of our tour. It was a stunning location, made even better by not having to share it with hundreds of other tourists (which we could see from our exclusive viewpoint). Again, we were able to take our time here, free to walk along the edge of the canyon and enjoy various views of the Colorado River. Since I was unhappy with the shadows in my photos, we decided to go to the public Horseshoe Bend overlook for sunset. It was so packed with people vying for the perfect photo spot that I worried about accidentally getting bumped over the edge. Our earlier visit was definitely not as nerve-wracking! We both really enjoyed the laid-back nature of our Secret Canyon tour. It was our first time being inside a slot canyon and having such a positive experience made us want to visit more slots. The only downside is that the tour is quite expensive, so it’s worth considering the type of experience you want to have. For me, the price was worth it to avoid being rushed through in a crowd. I’ll pay more for a smaller, more intimate tour than an assembly line-like one any day. Even though Secret Canyon is a wonderful alternative to Antelope Canyon, that’s not to say that that Antelope isn’t worth visiting as well. We decided rather last minute (the night before) to book a tour of Lower Antelope Canyon and were glad we did because it was stunning. However, the actual tour experience was the complete opposite of what we enjoyed at Secret Canyon. Still, we were happy to have seen both canyons and discover what makes each of them special. I hope that Horseshoe Bend Tours keeps Secret Canyon a small-group experience because I’ve seen too many places lose their magic because of over-tourism. It would be a shame for that to happen here. Tours: Secret Canyon can only be visited by guided tour and Horseshoe Bend Tours has exclusive access. You can choose to do just the slot canyon tour or combine that with a visit to Horseshoe Bend (what we did). The canyon tour takes about 2.5 hours while the combination tour lasts roughly 3.5 hours. Tours usually depart hourly from 8:00 am to 4:00 pm, but this can change depending on daylight hours. We went at 9:00 am in early January and as you can see from the pictures, we saw some nice colours but it was still a bit dark in places. Maybe there would be more light in the canyon closer to mid-day. Maximum group size is 15 and only one tour group is in the canyon at a time. You get to spend up to one hour in the canyon. Tours depart from the office in Page, Arizona. Difficulty: There are no stairs or ladders in the canyon, but it does require walking on sandy terrain. For your convenience, here is a list of hotels in Page. Please consider booking your Page accommodations through the included link. It costs you nothing extra and helps support this website. Thank you! We were hosted by Horseshoe Bend Tours in order to bring you this story. As always, I speak only the truth and hosts have no editorial influence on articles.